cies that occupy a narrow temperature range are referred to as stenothermal, while those that thrive over a wide range are called eurythermal. In addition, a species may be considered adapted to cold-, cool-, or warm-water thermal environments. Few taxa are able to cope with very high temperatures, however. Cold-water fishes cannot survive water above 25°C for long, and most warm-water fishes including the pike family (Esocidae) and many minnows (Cyprinidae) have upper limits near 30°C. Some fishes of desert streams can tolerate nearly 40°C, a few invertebrates live at up to 50°C, and specialized Cyanobacteria of hot springs survive 75°C (Hynes 1970). cycle is to alternate short periods of rapid growth separated by long periods of dormancy or diapause (Danks 1992). Such life cycles are often seen at high latitudes and may require exposure to near-freezing temperatures followed by a rapid temperature rise in order to break egg diapause. When a deep-release dam was built on the Saskatchewan River, winter temperatures were maintained near 4°C, and so the cue to ending egg diapause was eliminated. Virtually all taxa disappeared from the stretch of river with modified temperatures. A fauna that previously included 12 orders, 30 families, and 75 species was reduced to only the midge family Chironomidae (Lehmkuhl 1974). Differences in thermal regimes, whether natural or anthropogenic, can have complicated effects on the life cycles of aquatic insects. As with all ectotherms, their growth rates increase with increasing temperature provided sufficient food is available. Often, but not invariably, insects that complete their life cycles more rapidly due to warmer temperatures mature at a smaller final size. 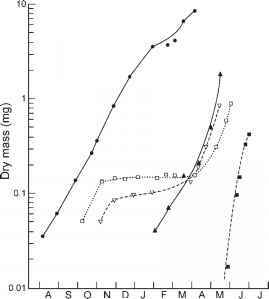 Thus thermal regime can alter the timing of adult emergence and adult size, and because the number of eggs produced by a female usually is a logarithmic function of her mass, fecundity is also affected. Ephemerella dorothea individuals emerging from cool tributaries of White Clay Creek were nearly twice the mass of those emerging from a warm tributary (Vannote and Sweeney 1980). There is also evidence that species have an optimal temperature range where both body size and fecundity are maximized. Rearing studies with the mayfly Centroptilium rufostrigatum showed adult body size to be reduced at both high and low temperatures, suggesting that intermediate values were optimal (Sweeney and Vannote 1978). New Zealand, the temperature that killed half of the individuals in 96 h (the LT50) ranged from 22.6°C to 32.6°C; the highest tolerance was for an elmid beetle and the lowest was for the mayfly Deleatidium. Based on temperature records for over 100 New Zealand rivers, maximum temperatures exceed the thermal tolerance for Deleatidium at over one third of sites, and high temperature was more likely to be a limiting factor in streams of the North Island than at South Island sites. Laboratory results on thermal tolerances were also consistent with field observations (Quinn and Hickey 1990) that Plecoptera and Ephemeroptera were much less abundant in rivers where typical summer temperatures exceeded 19°C and 21 °C, respectively. The influence of temperature on growth and its interaction with food supply has been well studied in trout (Elliott 1994). 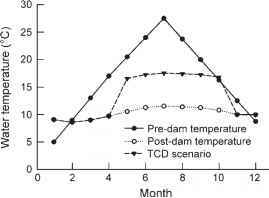 In brown trout, growth rate increases with temperature over the range from a few degrees to approximately 15 °C, and then declines dramatically with further temperature increase. Although warmer temperatures increase feeding activity and digestion rate, they also raise respiratory rates, and for brown trout the energetic costs of high metabolic rates significantly curtail growth when reared at constant temperatures much above 15 °C. As can be seen in Figure 5.15, food availability is critical. At maximum rations, warmer temperatures promote faster growth, but as food ration declines the energy budget turns negative because the fish's metabolic rate is controlled by temperature. This is the typical response of all ectotherms approaching their upper temperature limit for growth, which may be several degrees lower than the thermal tolerance revealed in a short-term mortality trial. The importance of temperature to large-scale distribution patterns in river assemblages can be seen in the longitudinal zonation of invertebrates and fishes along a river's length. 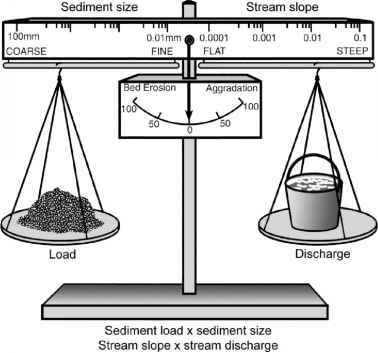 A downstream increase in macroinvertebrate diversity is especially apparent in alpine streams (Allan 1975, Ward 1994). Typically, dipteran larvae (midges nj >.